When I took part in a poetry class at the local University Extension back in April and May, the instructor told us a number of times to read poetry more often than write poetry. For the reason that teacher and Stephen King stated – having the tools to write – I decided to make it a mission for the summer to read books. I mentioned it in a March 18th post about being “Somewhat Busy.” At that point, I had read two books and was beginning to keep a list of reading recommendations. The reading recommendations have turned into a long list and I’ve managed to get through nine books in three months, in between the dancing, working, biking and friendships. It would have been ten, except that the binding on Leonardo DaVinci’s large biographical tale came loose and the pages started to fall out. The lady at the library said that can happen with the larger books, but I was bummed that I had only made it a third of the way through this interesting man’s story. I will get back to Leo at some point…when the book is replaced and I’m ready to dig back in. I’ve lived several lives through the summer: As a woman planting a garden, a man wandering in the cold, a historical figure on a mission, a Russian spy, an artist who had a difficult time finishing his work, a savior to the world’s sick children and a detective solving a murder. I had been living one life before this, one that was devoid of these characters and the moments and storylines that leave me wanting more. I am anxious to know more, to read more. To not be embarrassed that I didn’t know the library for so many years. I have a card now, a card that will teach me about people, places and events, and send me all over the world and out into space. When I am in the library, I feel like a kid in a candy store. There is so much knowledge surrounding me that I don’t know where to go next or what flavor to choose. It all looks so yummy. I try not to have regrets, but not reading more books over the years has become one. What was I doing with myself? Living a life, I suppose, but I think of the many times I sat in front of the T.V. or spent hours on the computer when I could have been reading. So, I am attempting to erase those regrets. The summer reading project has become a continuing reading project. I’m not giving up now, even though it has cut into my writing/blogging time and the gym time and the sitting-in-front-of-the-TV time. I’m enjoying this new chapter of time well-spent in following the teacher’s and Mr. King’s advice. This post has been brought to you by the library and a plethora of books and Linda Hill’s One-Liner Wednesday. 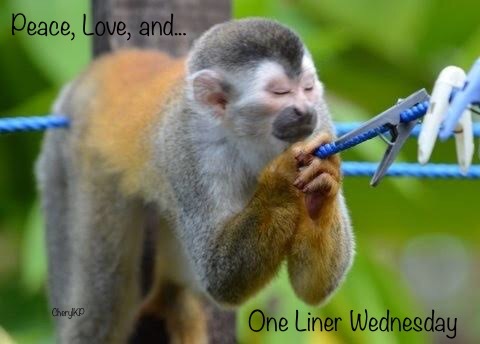 If you are wondering what One-Liner Wednesday is all about, CLICK HERE. This is a great post – a timely reminder without being all preachy and stuff. I love reading, and I really love reading poetry. I’m glad you’re rocking the summer reading list. I would never be preachy to anyone about reading since I was not a good example for a long time. Funny thing, not one of the books I’ve read contains poetry. I may eventually get to that if the reading list stops growing! Ha – Good luck with that. My reading list far out paces my ability to read. Nine books! What?!? I’ve seriously slacked off on my reading life, your post is a good reminder why it’s important to make time for it. Thanks. You’re welcome, Laura! I never thought I’d finish that many books this summer, but it helps that they were all good reads! Love the quotes and your commentary, Mary J. Hugs! Thanks Teagan! It was one of those posts when the quotes and story easily fit together without trying too hard. Hugs back! Excellent use of your time – and I agree, the library is like a candy shop! I rarely leave there without an arm full of books! Congrats on reading 9 in such a short amount of time!!!! I’m heading back to the library after work tonight to pick out more candy. Maybe a biography or true story this time. Sounds like a perfect way to spend a Wednesday evening! I used to say I do not read books, I inhale them. I am on a kick for the last two years now to fill the void of an empty nest with reading like I used to in the old days. It is part of my no blue light after 9 routine. I re-discovered the library when a new branch opened by the house last year. Kid in a candy store is exactly the feeling!! It opened my world and I attend monthly book club at the branch as more void filling. My Kindle is pretty much dormant these days as I favor the paper variety. I had a Nook at one time, but gave up the blue light for paper. I love to read before going to bed, but the electronics are not good for sleep. Enjoy your candy store and the book club. It’s a positive thing that you do. I liked that Brodsky quote and with everything digitized now-a-days it is even harder to burn them. So true, Frank. Who would want to burn a book or a Kindle? I love the library, but our household library is so extensive, I’ll never dig to the bottom of my TBR pile. And that doesn’t count what’s stacked up on my Kindle. But I absolutely agree that people who don’t read probably shouldn’t try to write. It’s like wolves raising a human: Not a BAD thing for a wolf to do, but the result probably won’t belong in a library. Nicely written, Mary, and I too am impressed at 9 books over 3 months! I’ve been an avid reader since I was quite young. Saturday afternoons always involved a trip to the local library to refill for the week. A couple of years ago, as part of my New Things list, I started to keep track of books I read and those I wanted to read … and for the first time I started to allow myself to abandon books that simply bored me to tears. Previously I had the mentality that if I started it, I had to finish it. Now I realize that there are simply too many great stories out there to read to waste time grinding through a book I don’t enjoy. I’m intrigued by the book about Leonardo di Vinci. What was it called? I too find him a fascinating man. The Book is titled Leonardo Davinci and is written by Walter Isaacson. The little that I did read was very interesting. I am keeping a list of books I want to read and those I’ve read, so can keep track. I know what you mean about letting go of a boring book. I just can’t read something that doesn’t catch my attention in the first chapter. Recently I gave up on a book after I was 2/3 of the way through. One day I finally realized – why am I reading this dog? Old habits are hard to kill. Sounds like good advice. I’m not good at writing poetry but I do dabble or try to write my own poetry sometimes. Practice, practice, practice, Crystal! Something else the teacher told us. Don’t underestimate your poetic tendencies, just keep writing! Thanks. I’ve got a notebook full of unpolished drafts. Thanks for the recommendation Cheryl. I have this written down on my list and will get to it at some point. Have to read four books I bought at a library sale last week and pick up another book at the library. So much reading to do and so little time! I feel ya! I’m so busy writing i hardly have inclination to read. Previous post Would James Approve?